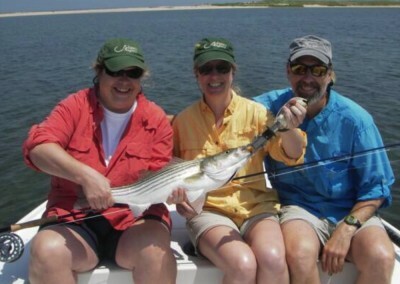 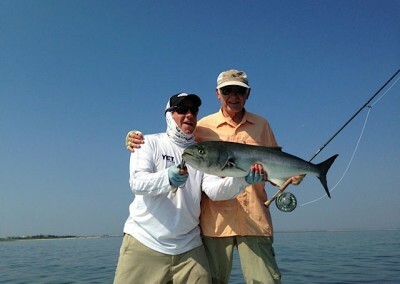 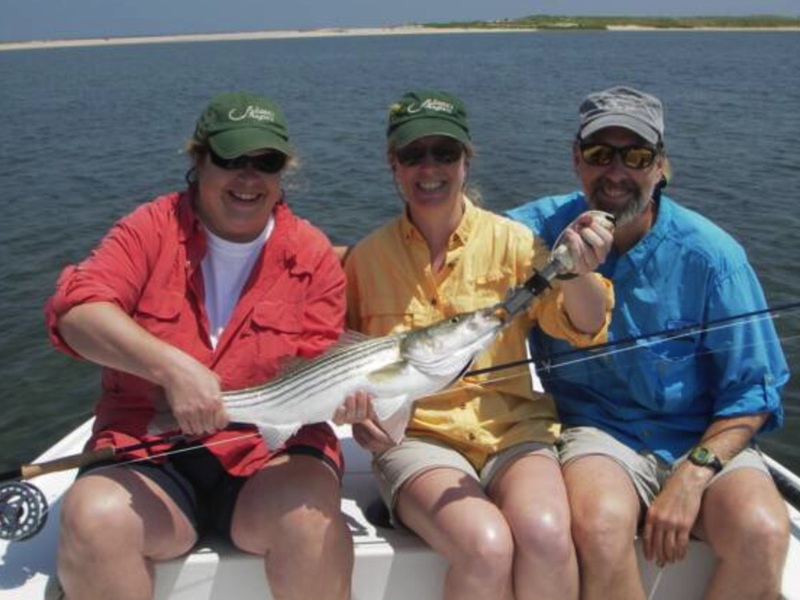 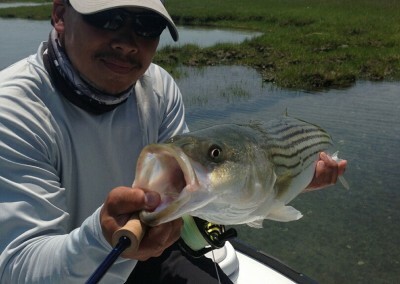 There is a synergy that exists between guide and client which makes a trip more than just a fishing excursion. 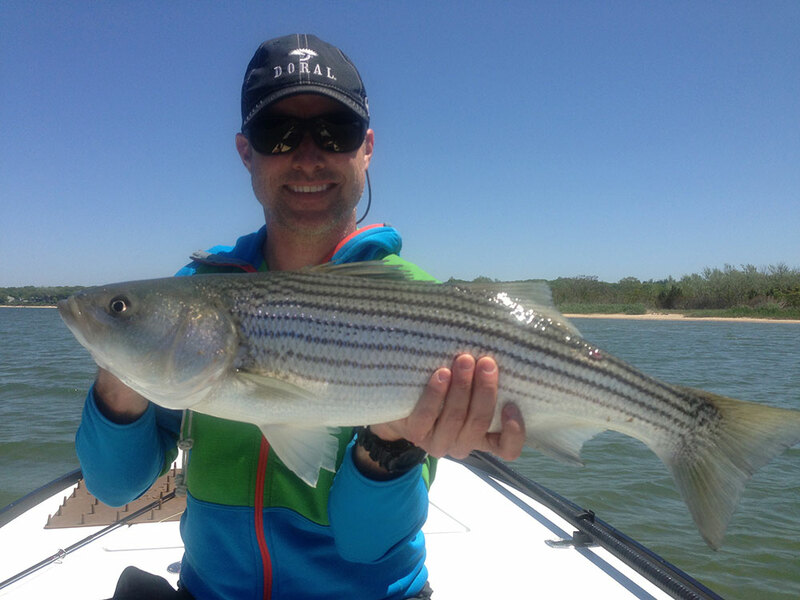 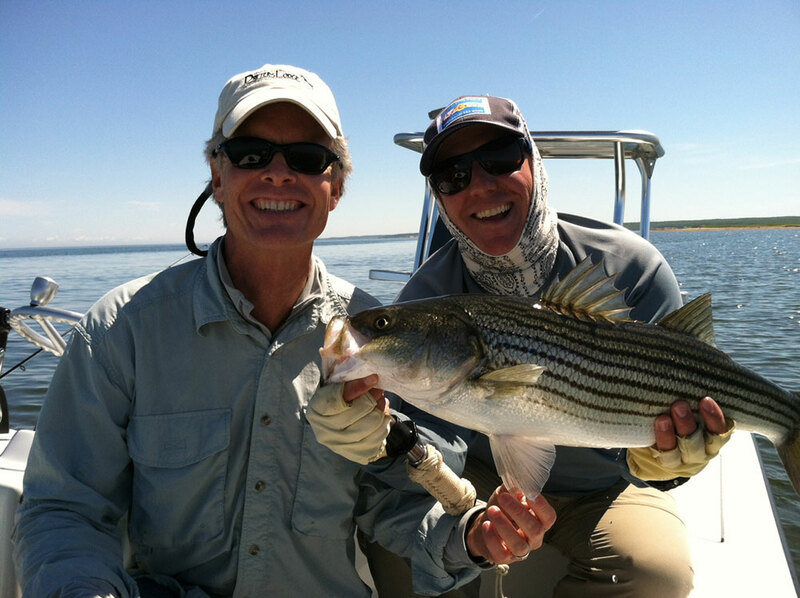 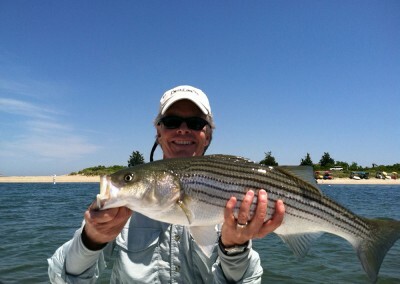 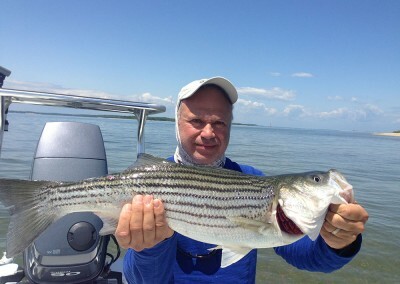 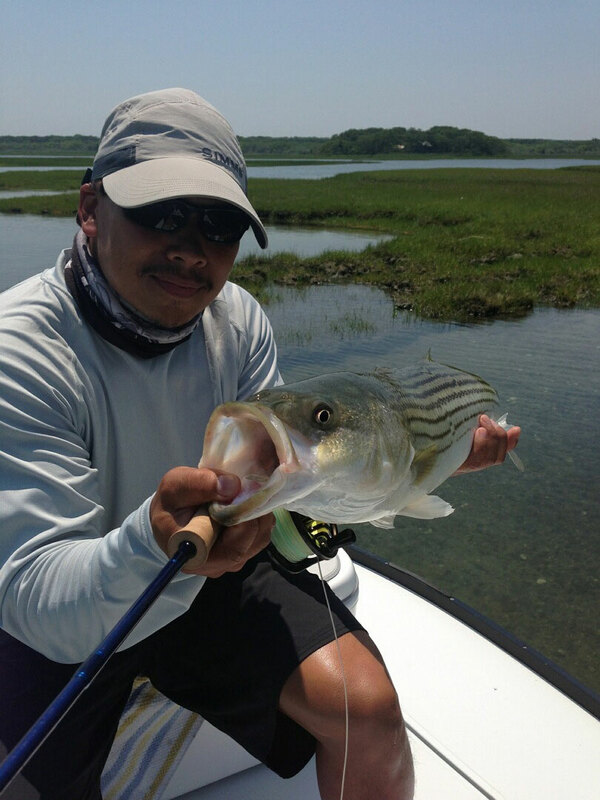 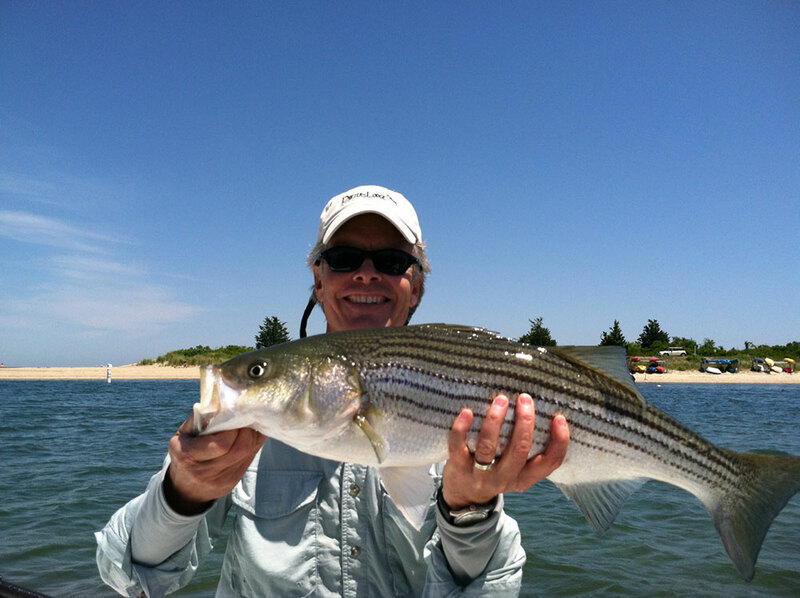 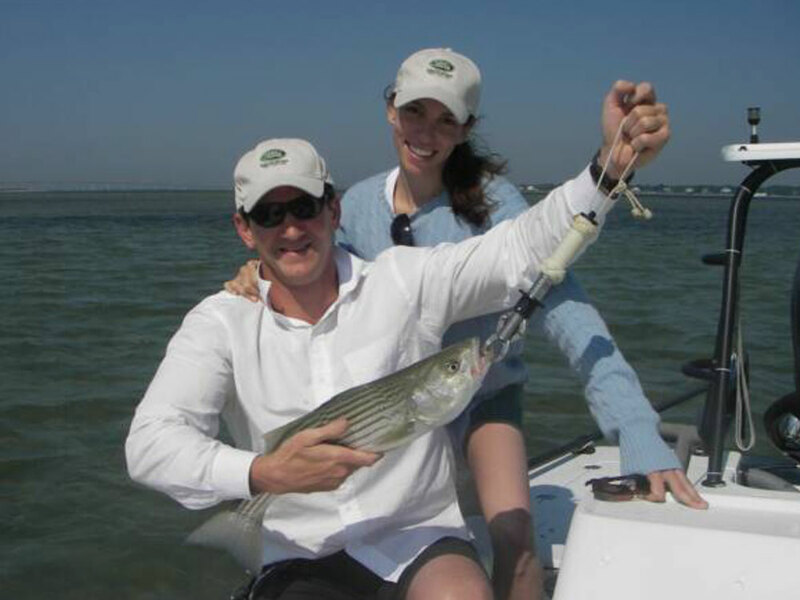 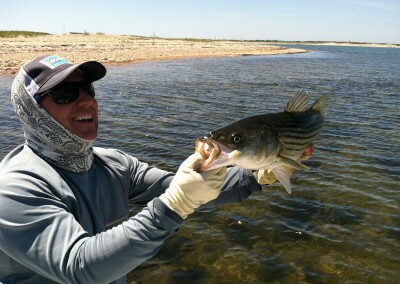 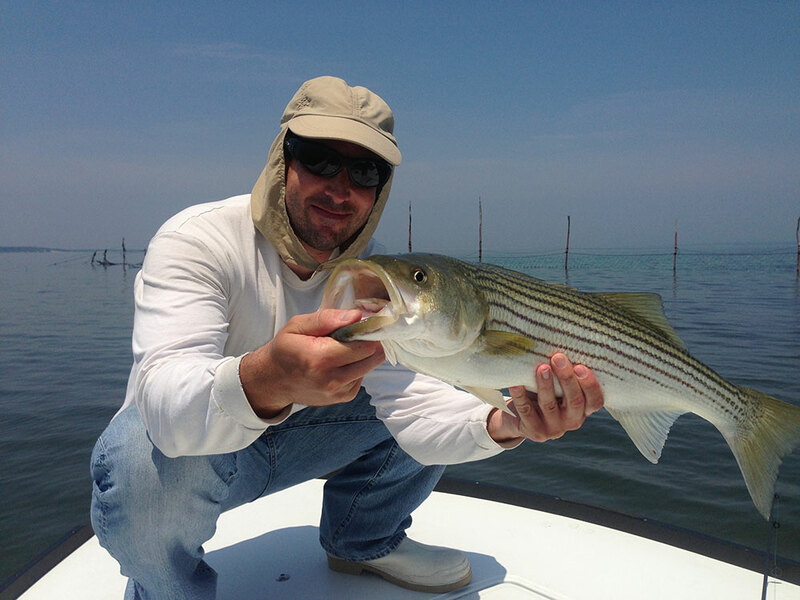 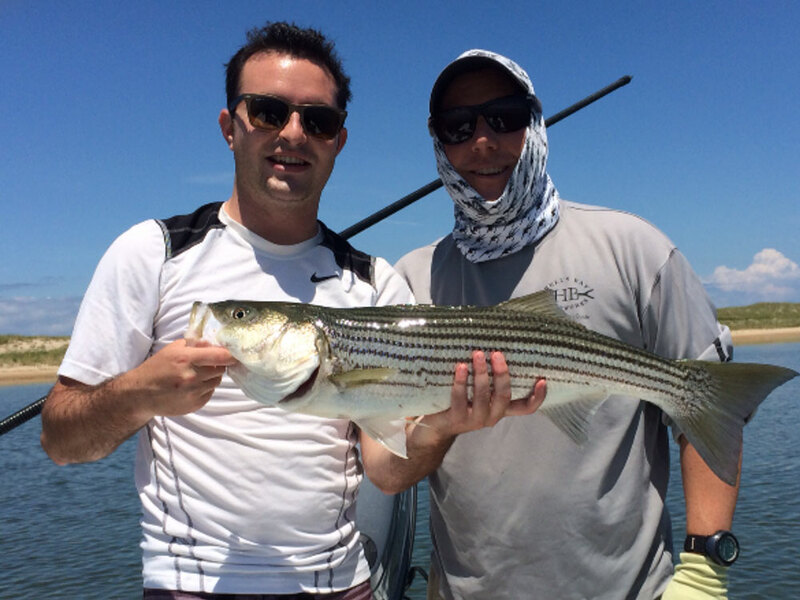 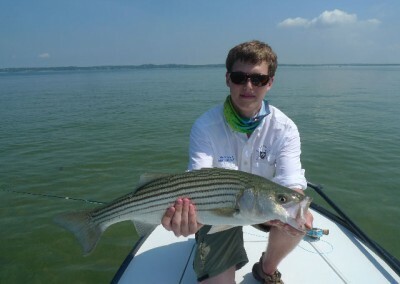 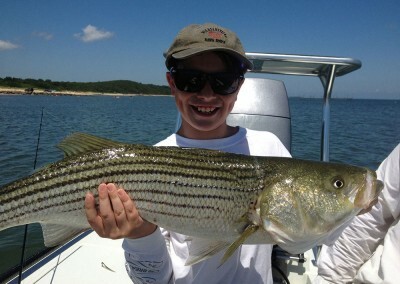 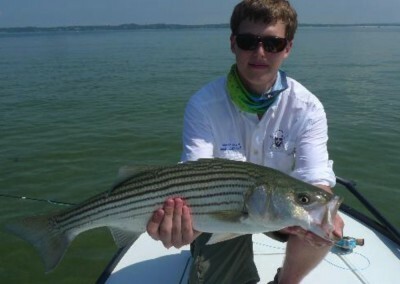 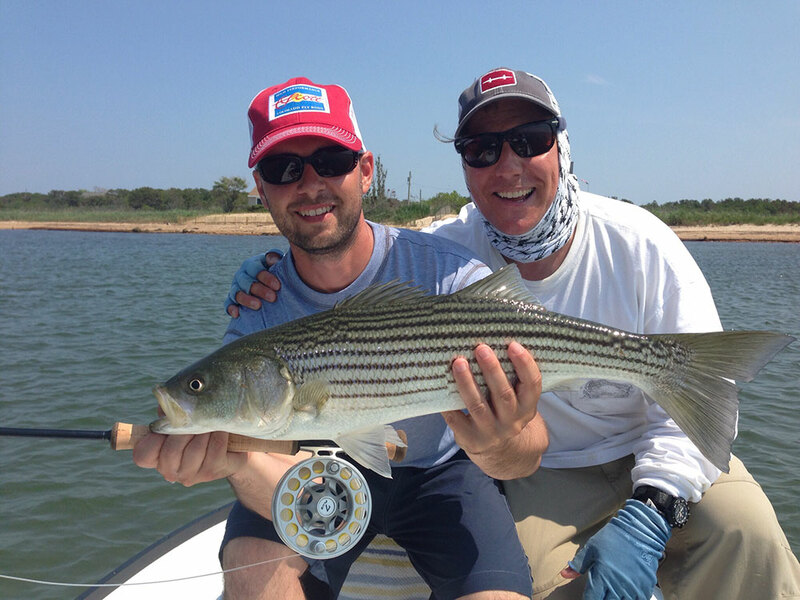 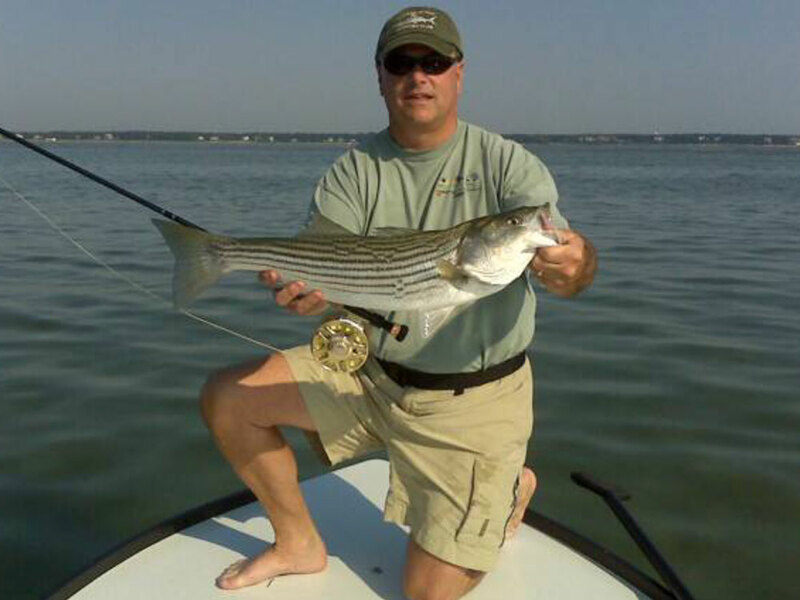 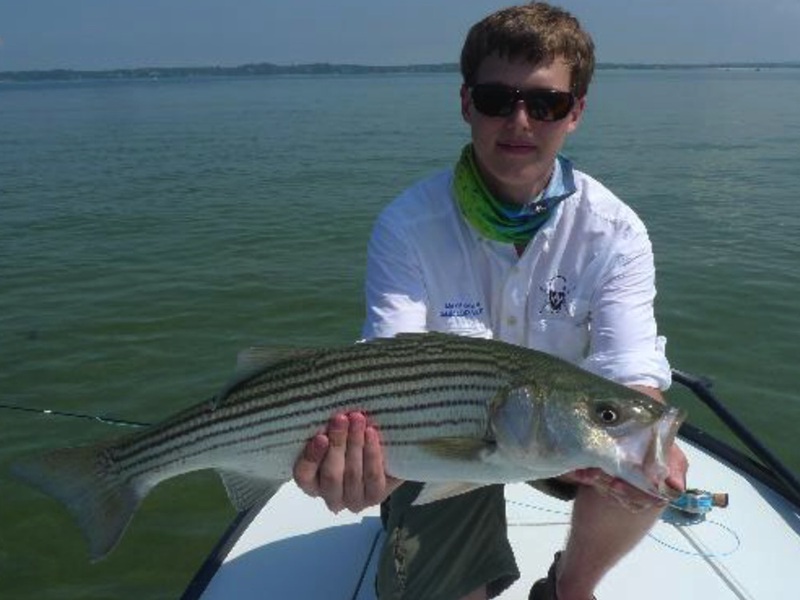 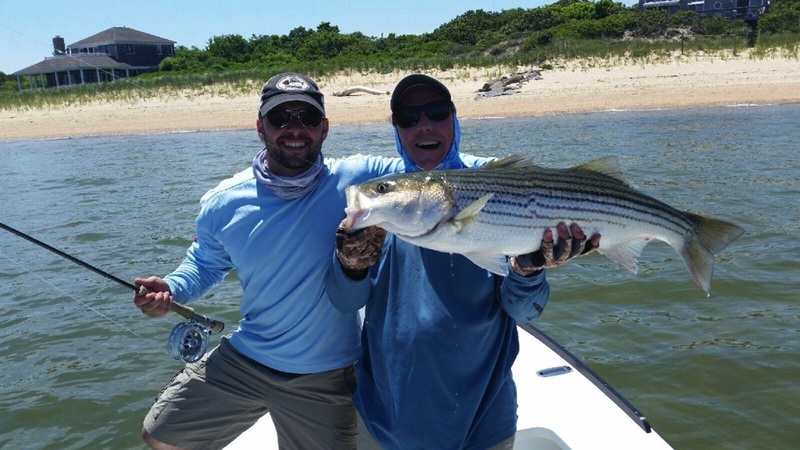 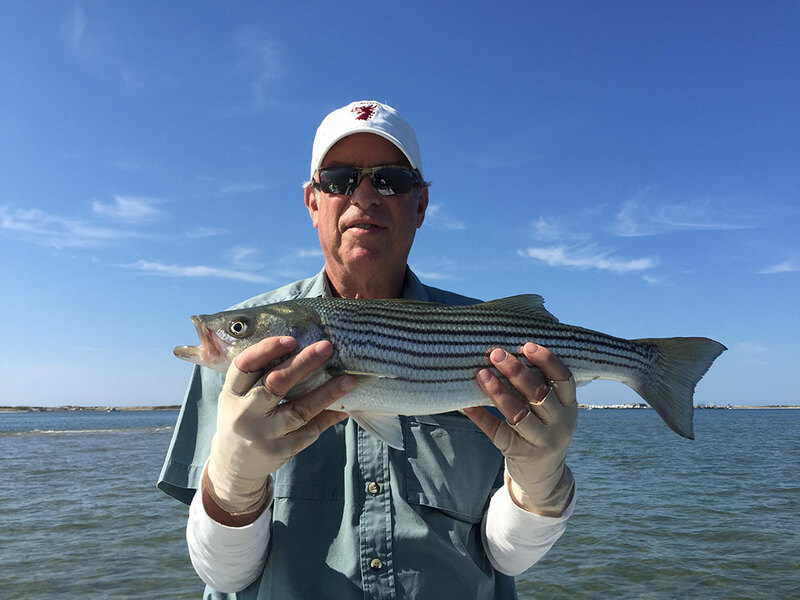 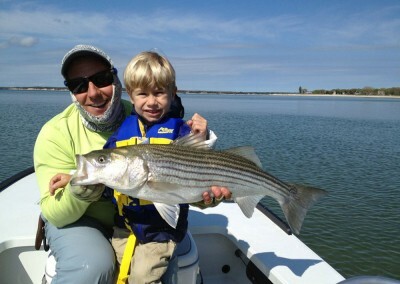 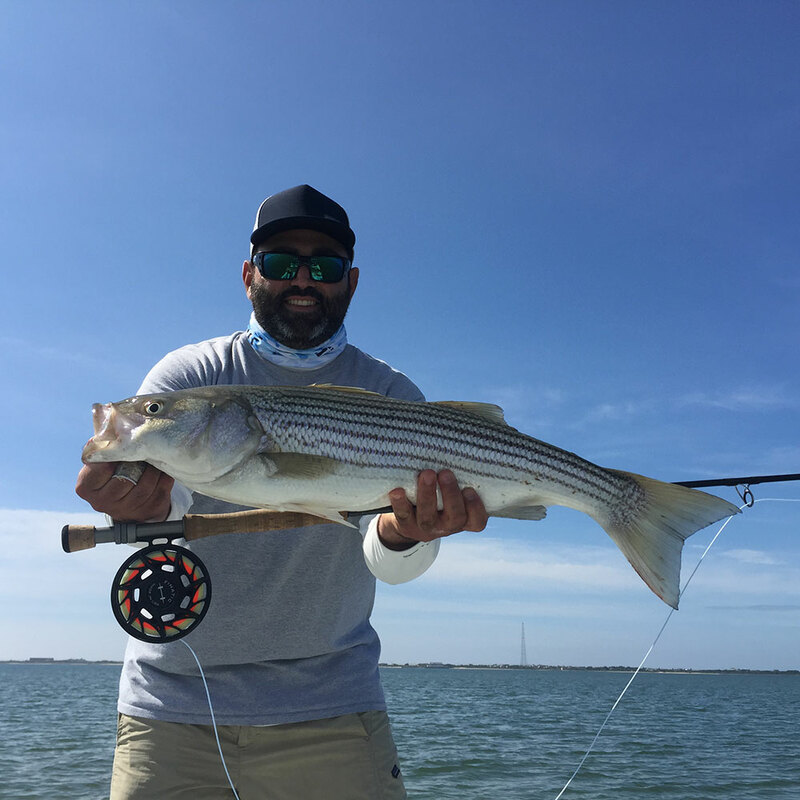 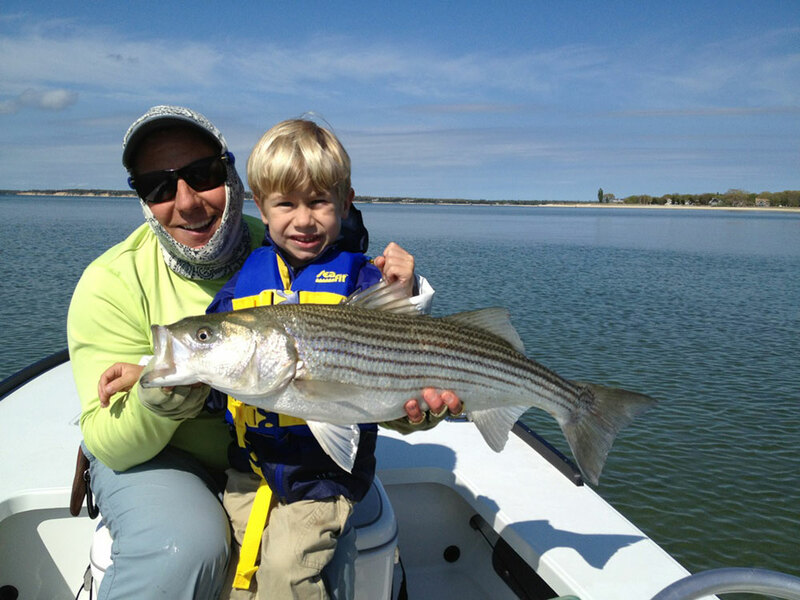 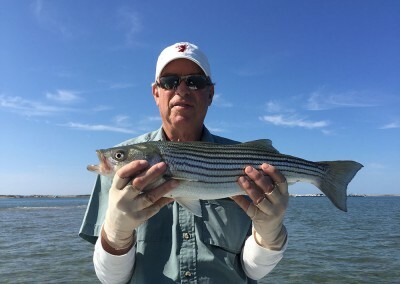 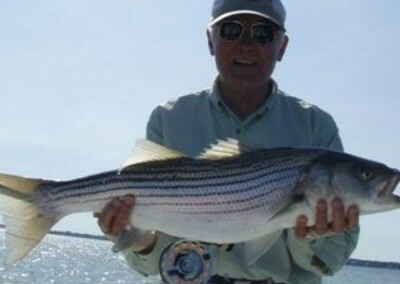 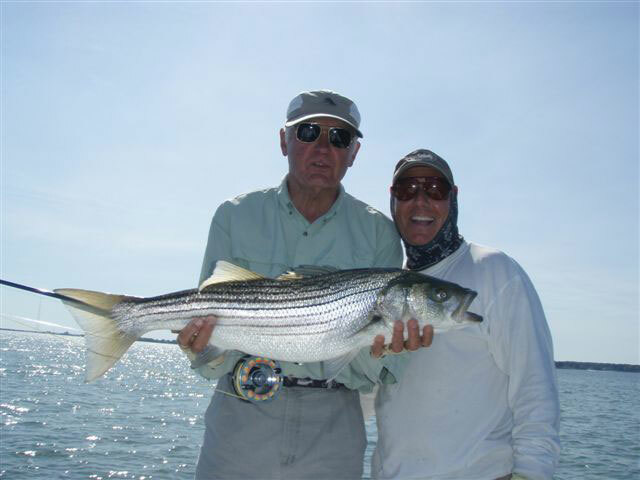 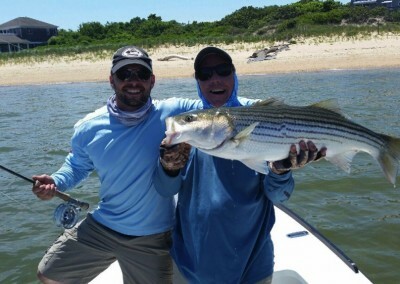 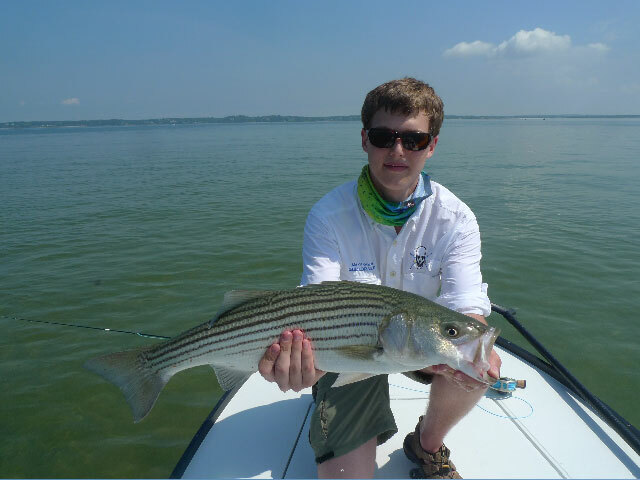 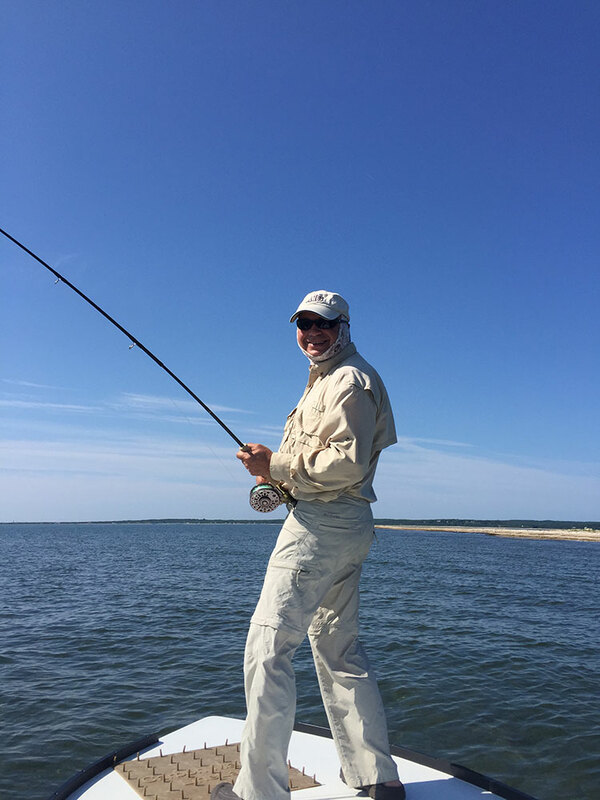 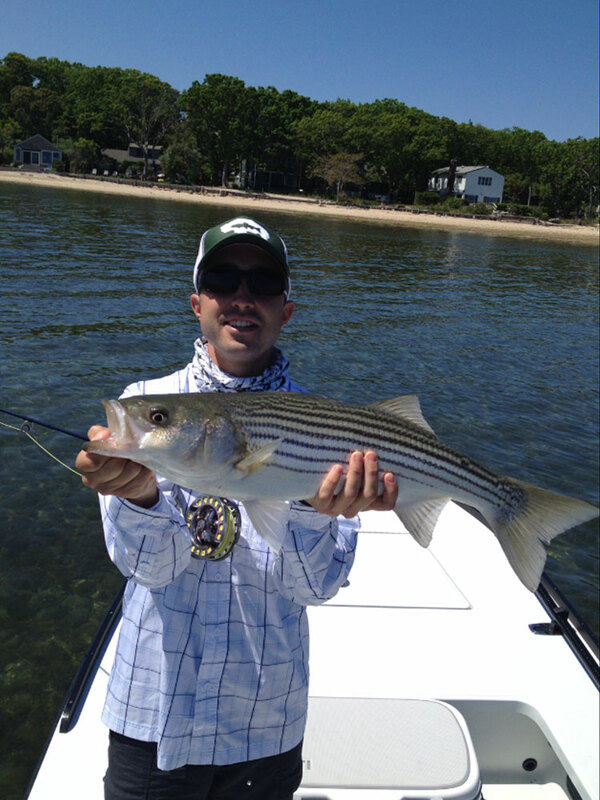 Merritt’s enthusiasm, cool demeanor and acumen jives well with the serenity of the flats on the East End and the striped bass that cruise in those gin clear waters. Some of the most beautiful, gin clear flyfishing waters in the Northeast are found on the eastern end of Long Island, New York. 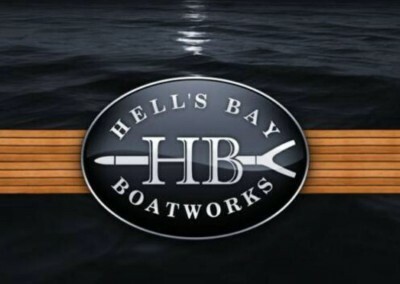 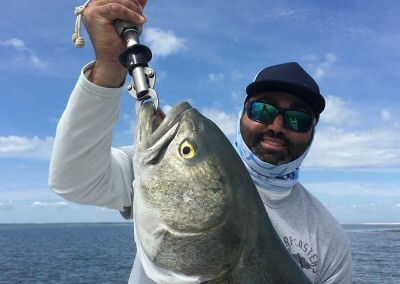 The classic sightfishing strategies that have been so successfully employed in the Florida Keys are now ever present here in the Hamptons in places like Shinnecock Bay in Southampton and Gardiner’s Bay in East Hampton. 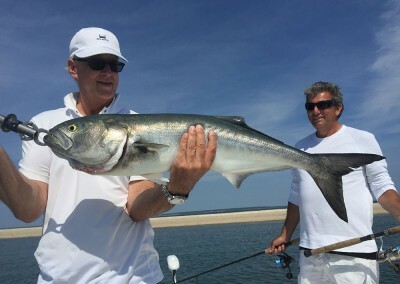 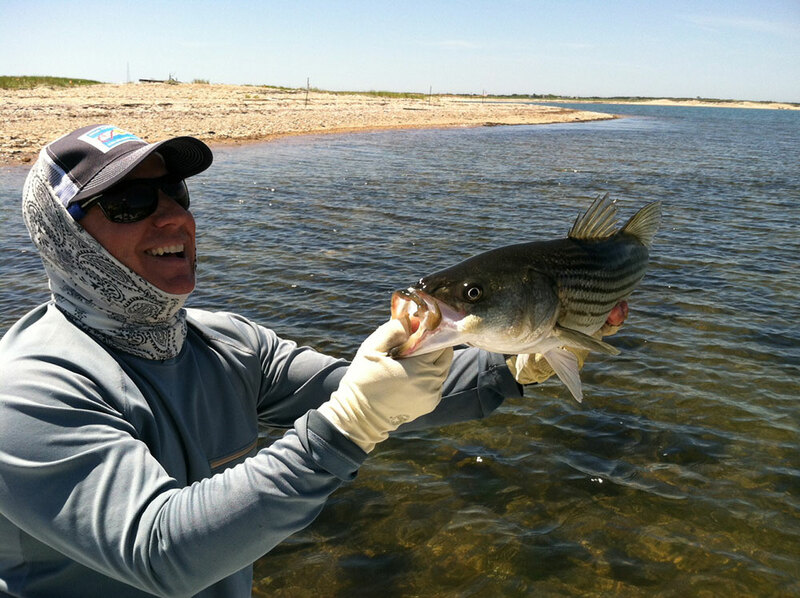 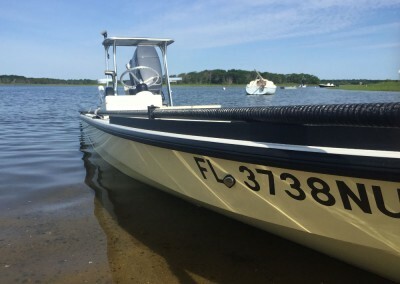 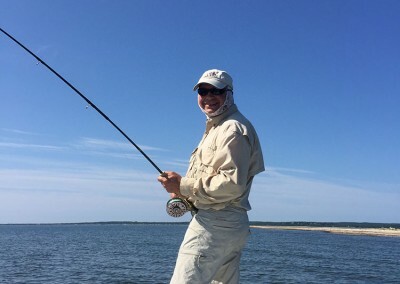 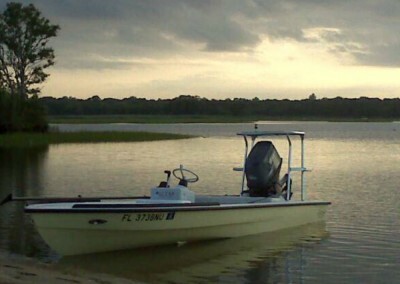 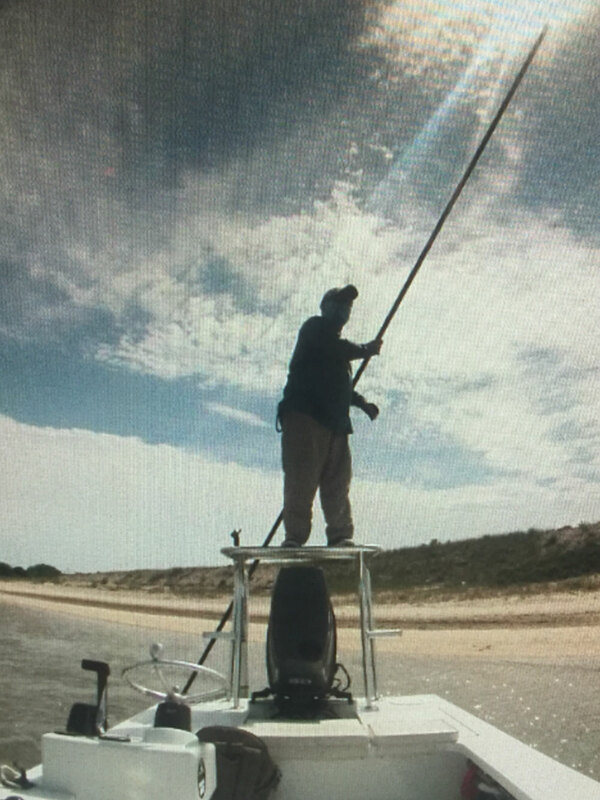 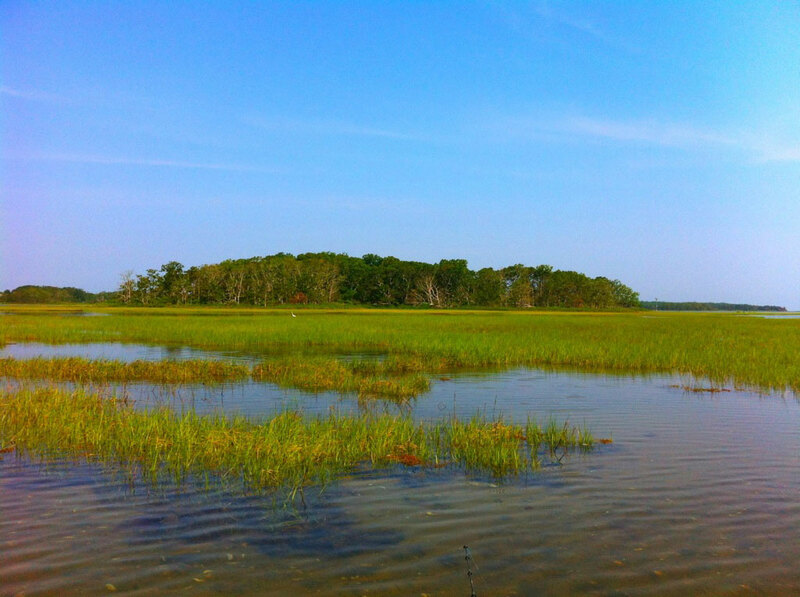 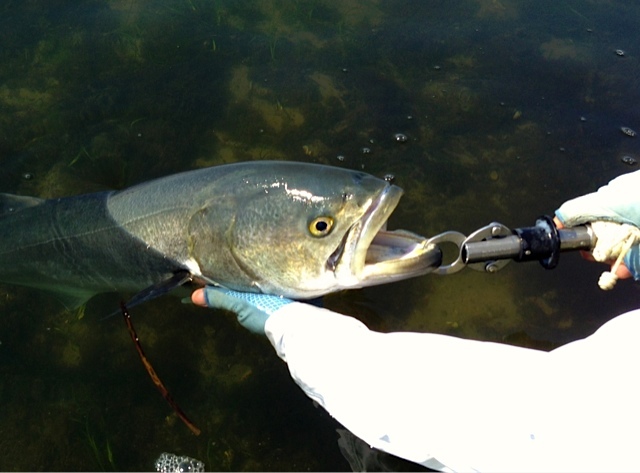 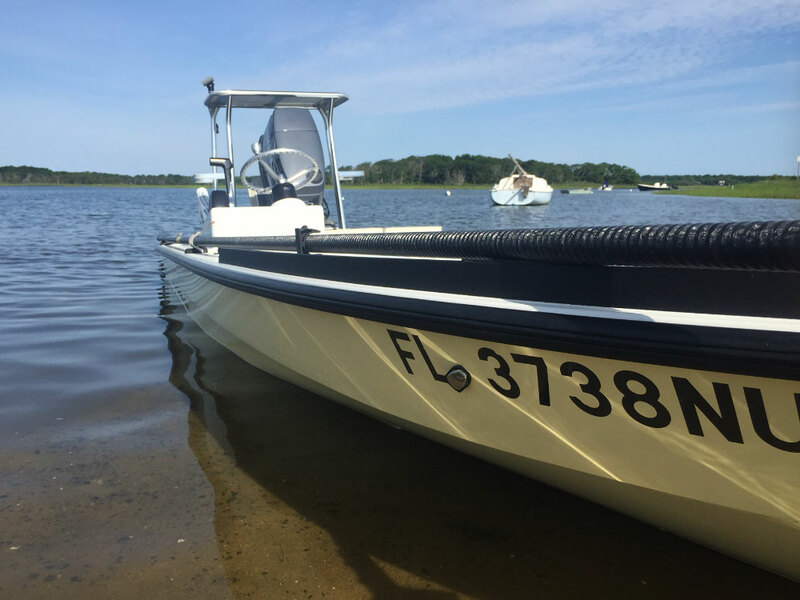 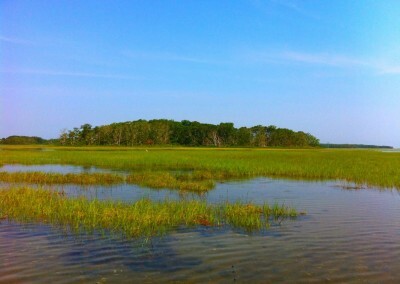 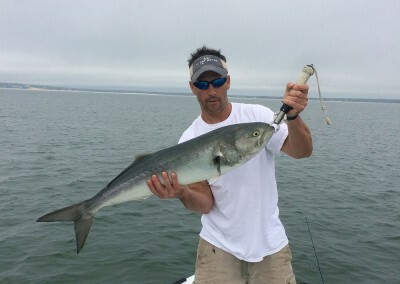 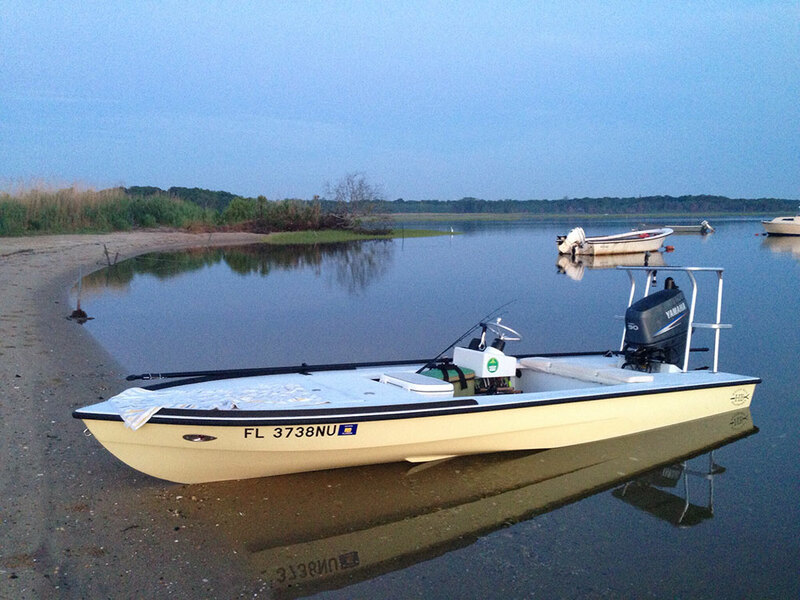 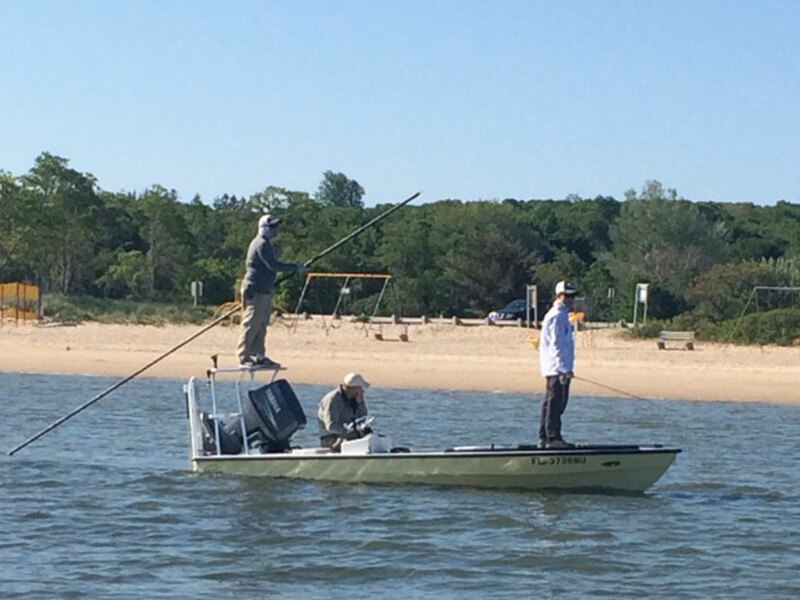 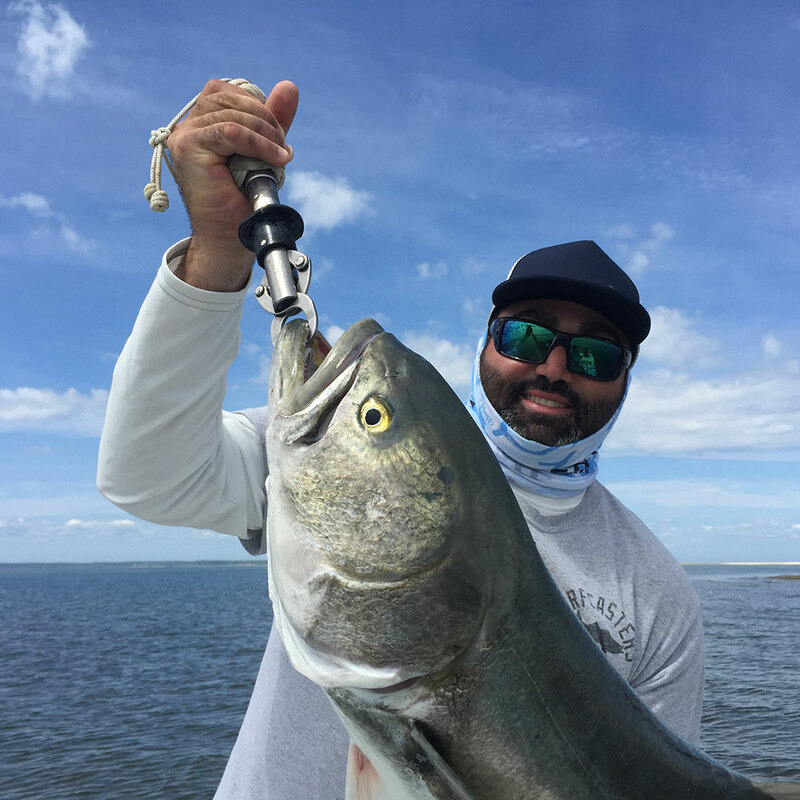 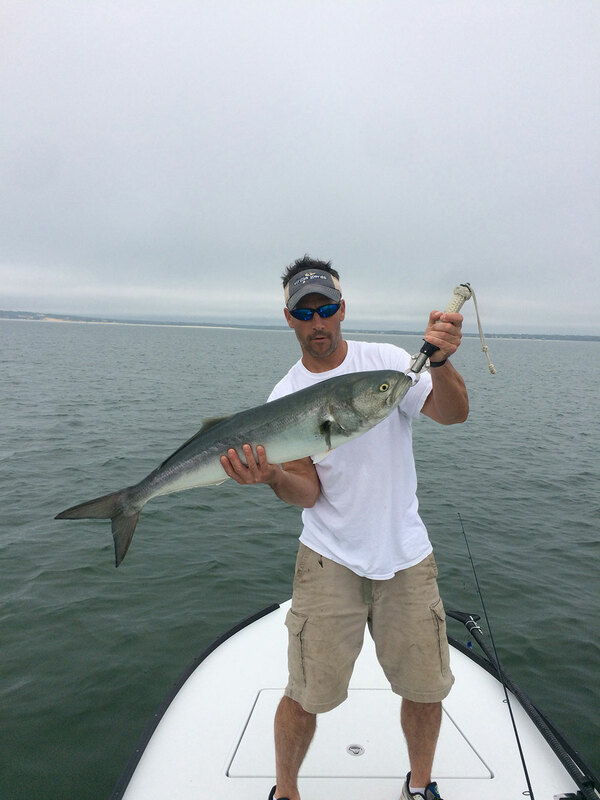 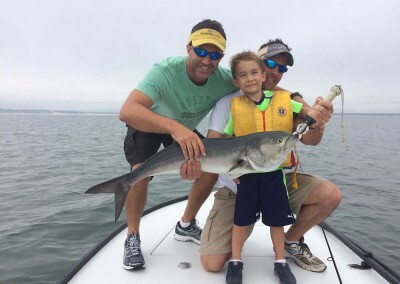 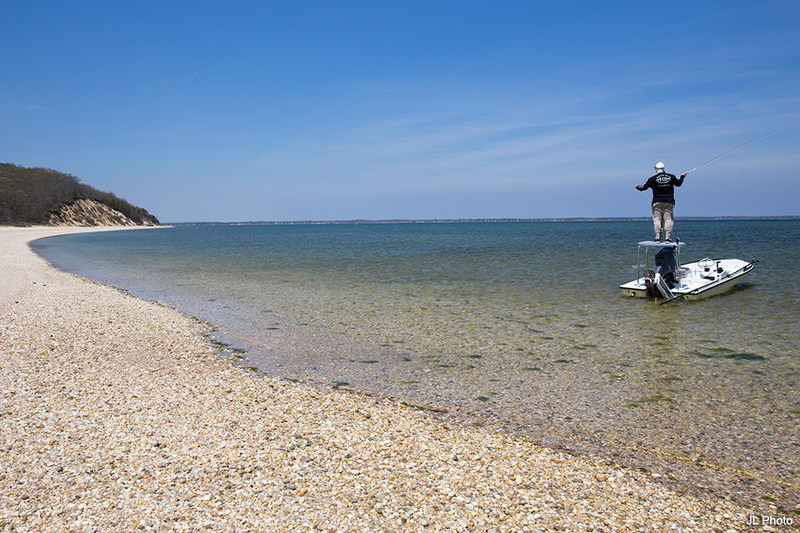 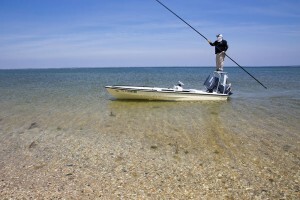 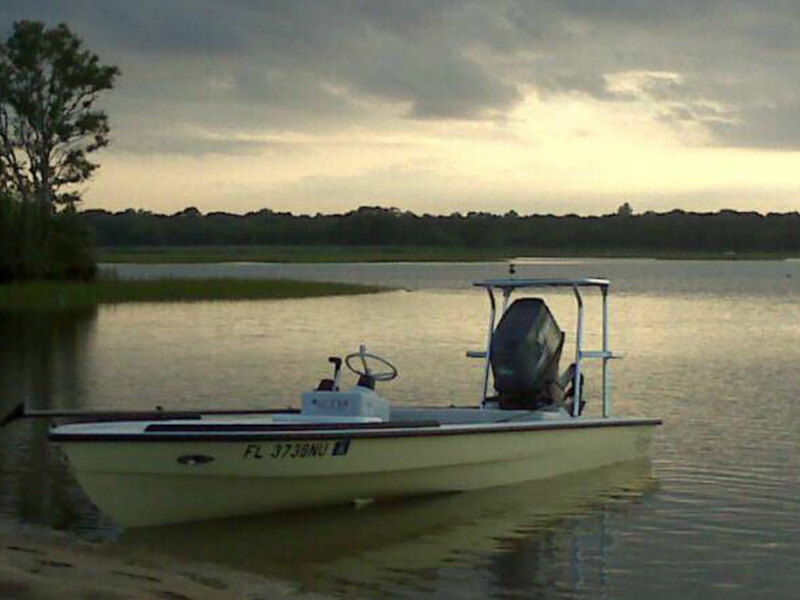 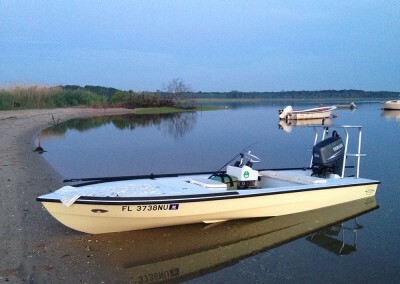 During the Spring and Summer we will hunt for bluefish and striped bass as they feed in inches of water across bright, sandy, rock strewn flats. 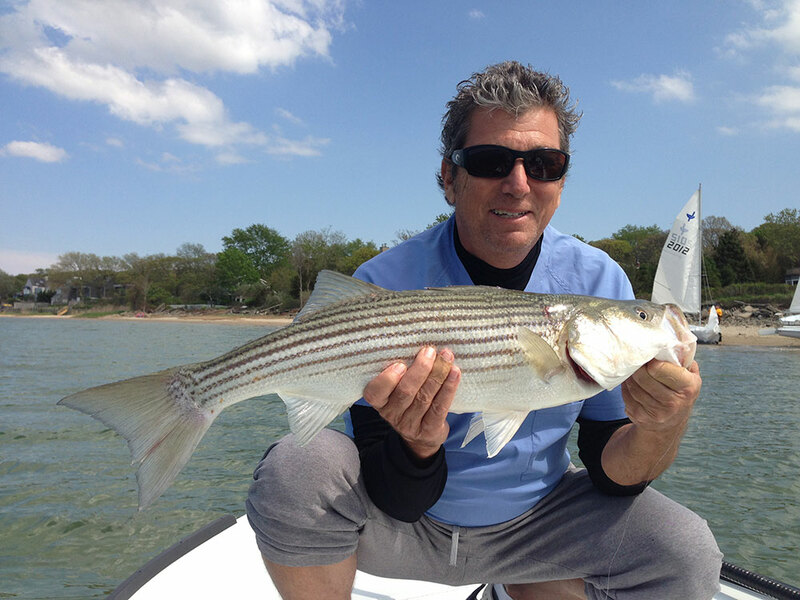 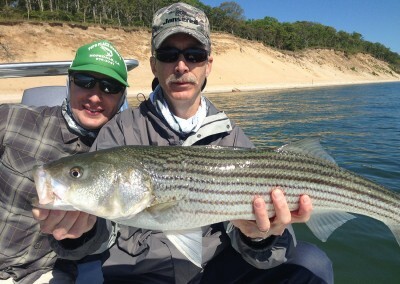 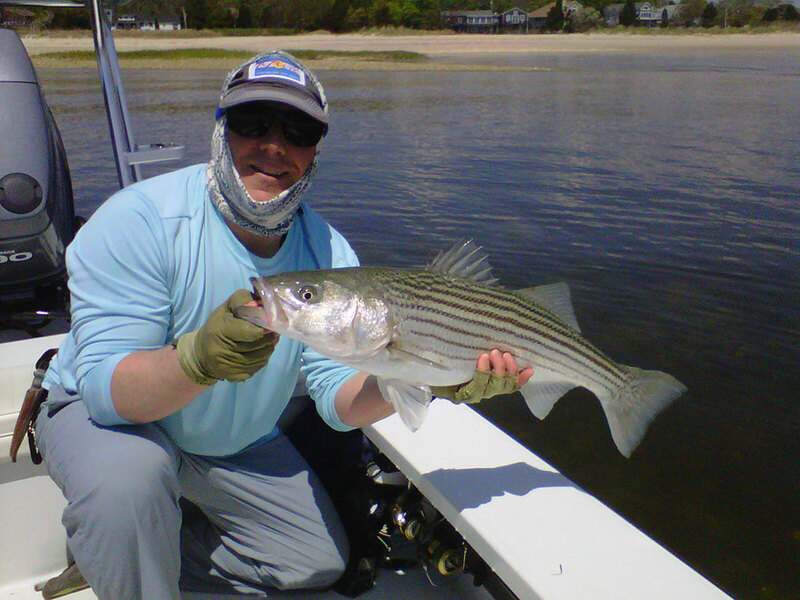 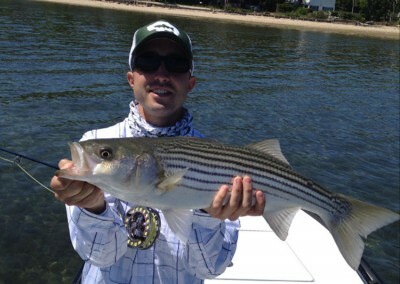 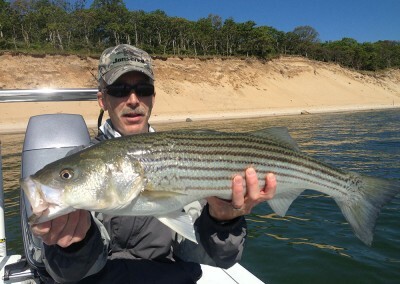 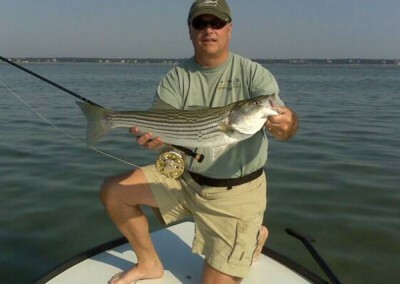 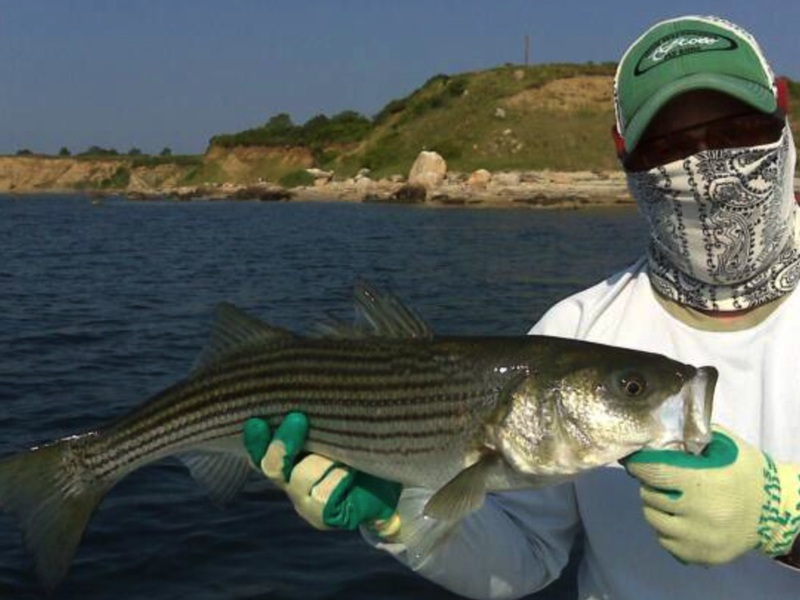 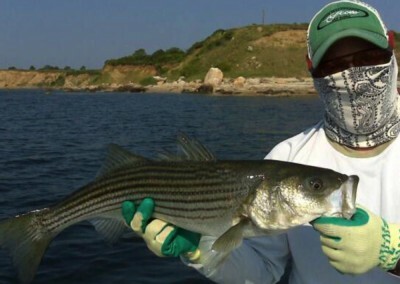 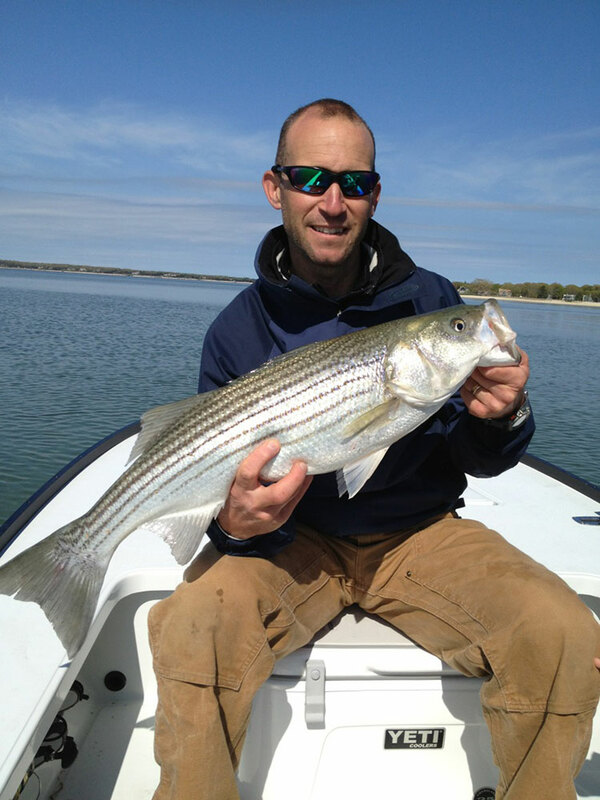 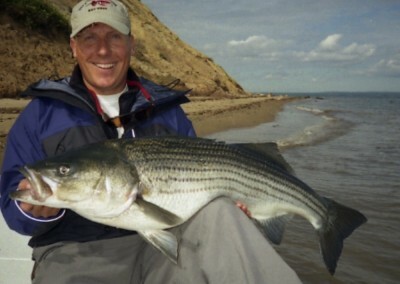 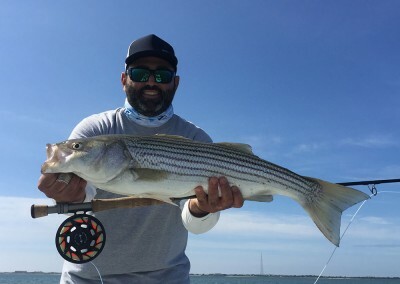 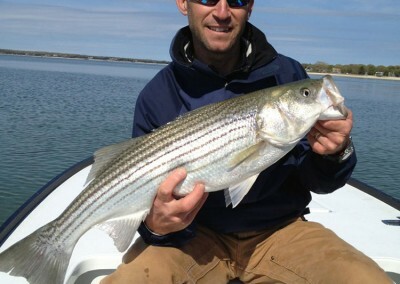 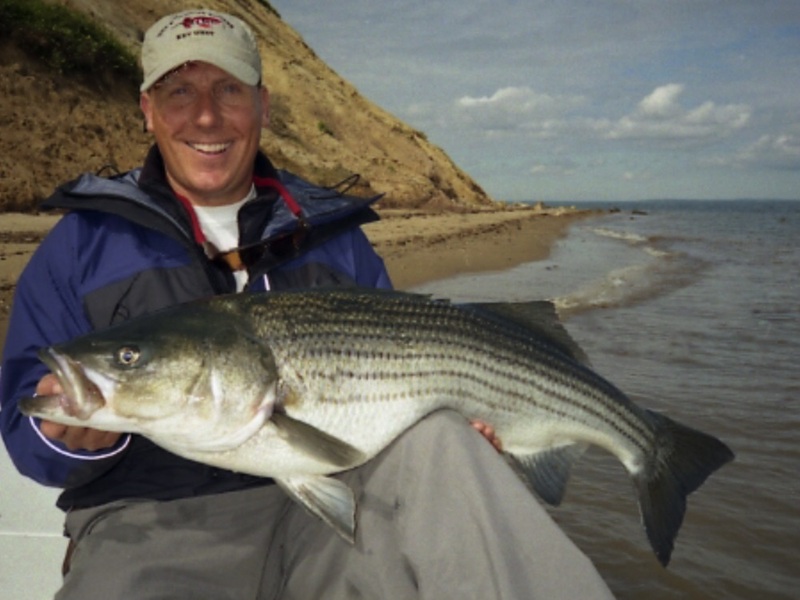 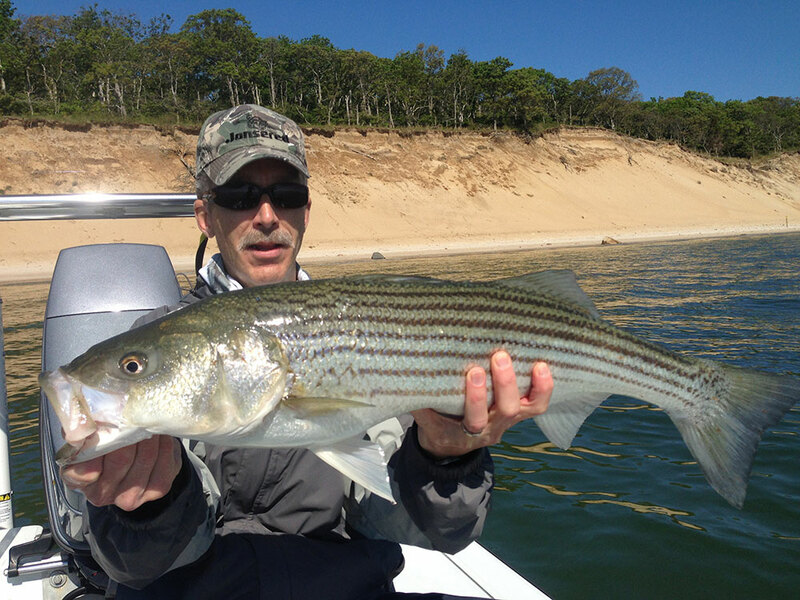 Stripers are the first to show in Long Island’s waters in the early Spring and the last to leave, some lingering into late December as they fatten up on the shoals of menhaden and then large herring that choke the waters at that time. 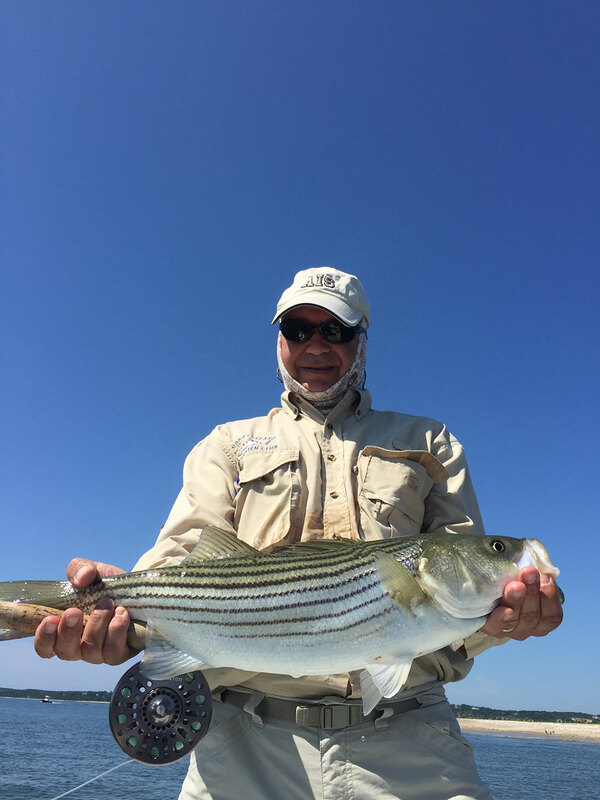 In Spring and Summer, stripers are king of their domain, as they warily stalk the flats in search of a wide variety of prey items. Smaller Finesse and Slugo style rubber jigs are the norm for ultralight spin tackle as are flies which imitate sand eels and spearring. 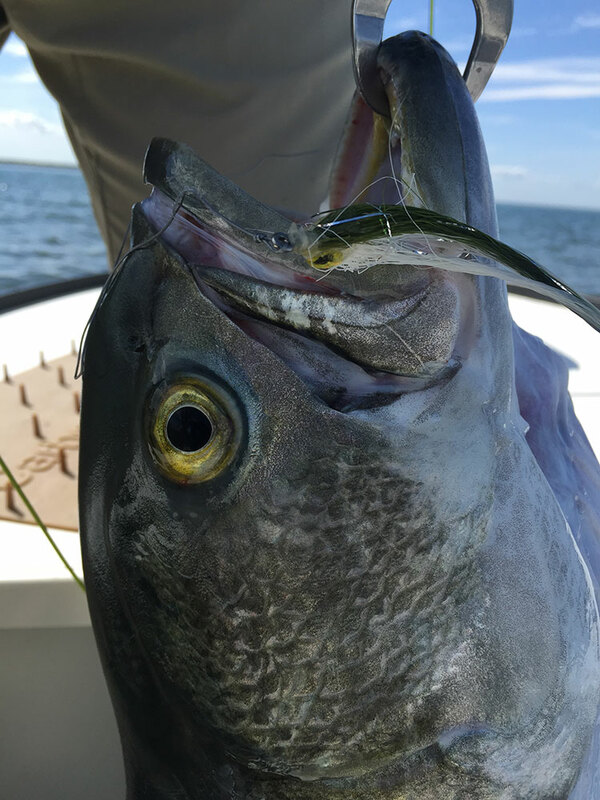 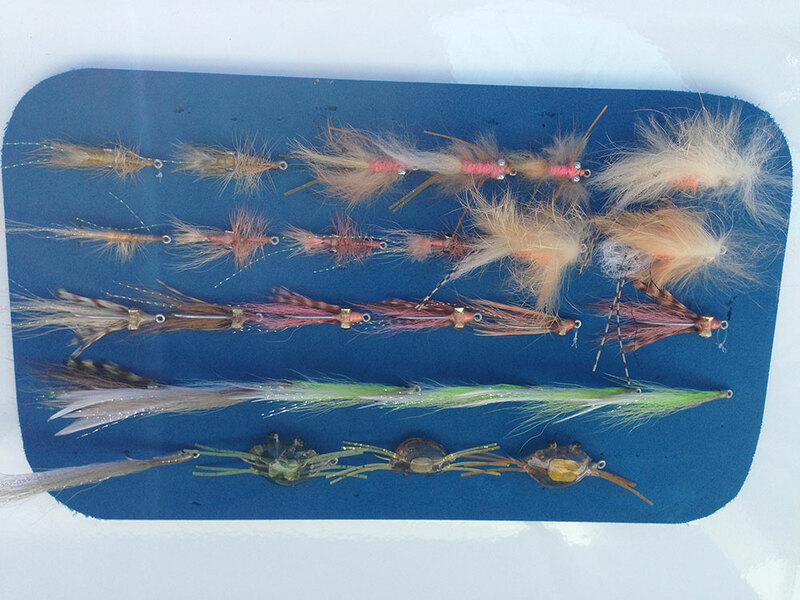 Bass can also be caught on juvenile flounder and crab fly imitations, further proof of their omnivorous diets. 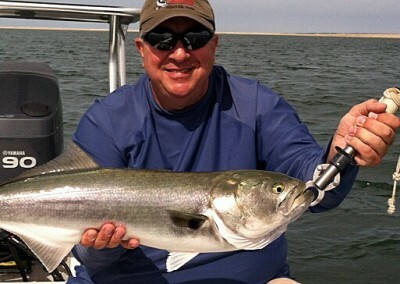 Although bluefish can be caught in shallow waters during the Spring and Summer, they are largely water column feeders. 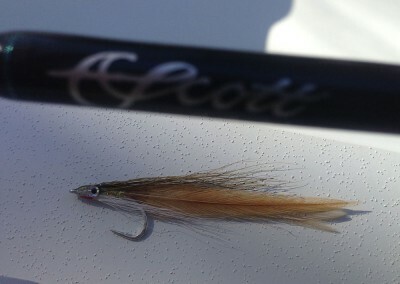 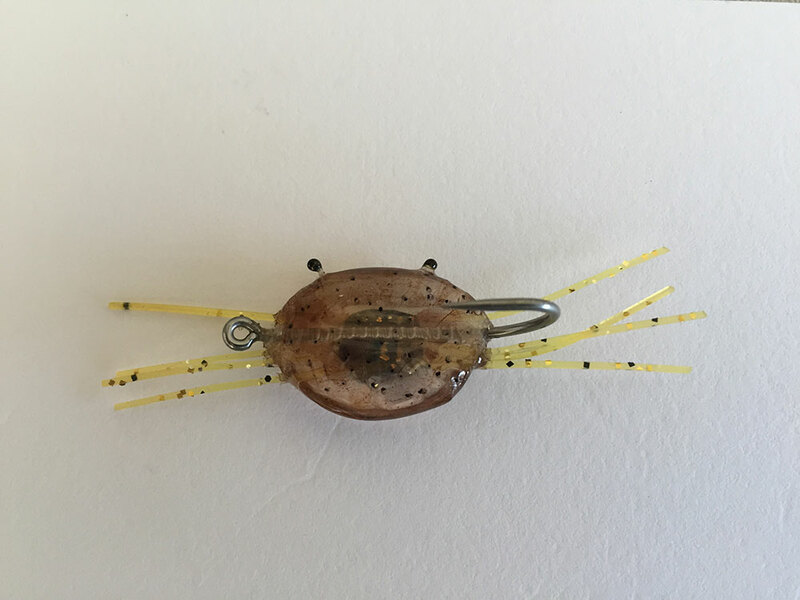 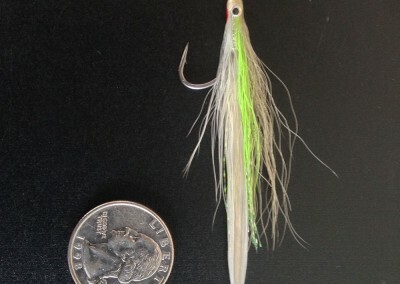 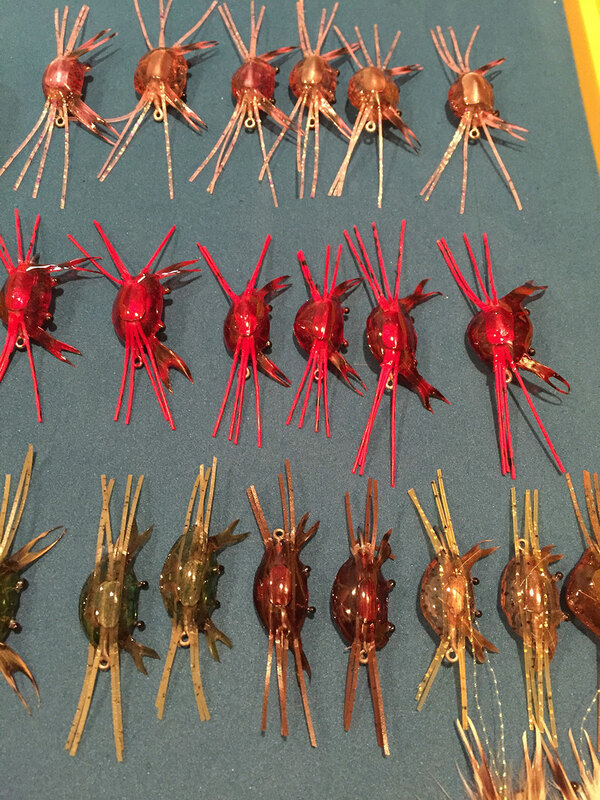 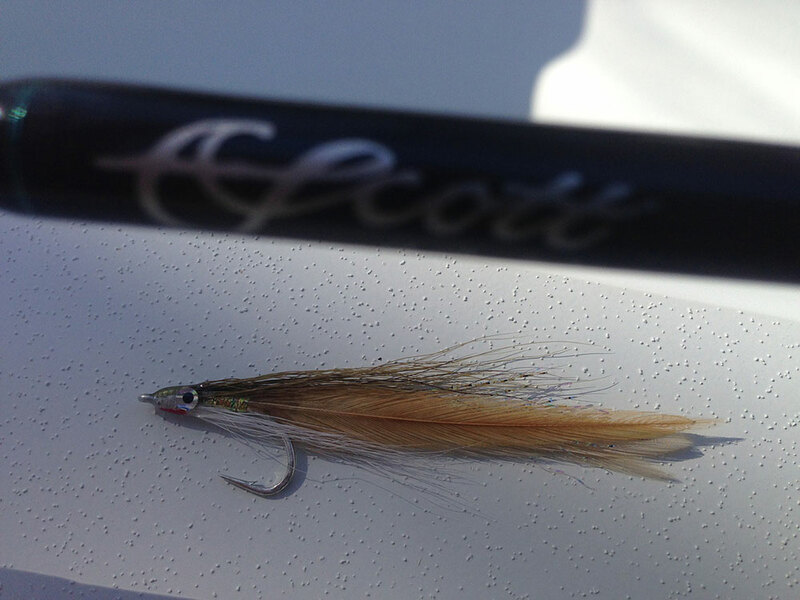 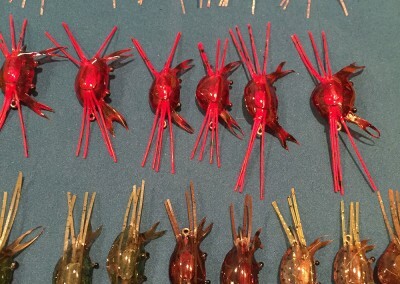 Typically they are not picky and become an easy target for fly and spin fishermen alike. 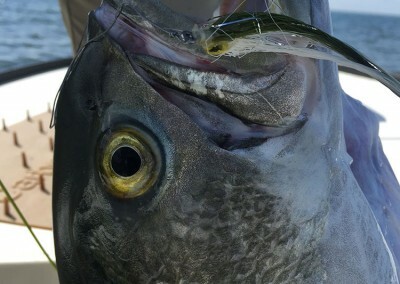 bluefish have a very well defined, razor sharp dentition. 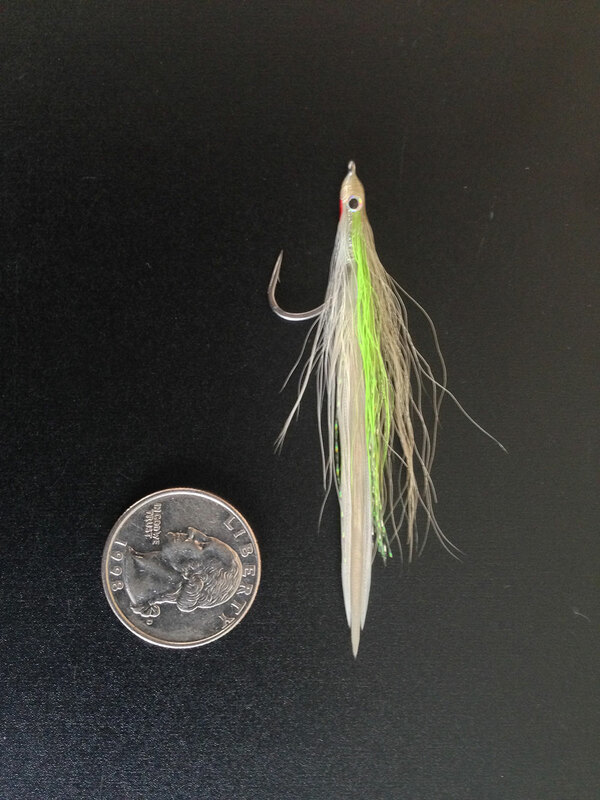 To aid in hook removal, just about any flies or lures with single barbless hooks will work. Once hooked, bluefish are relentless fighters, capable of several head shaking, surging runs. 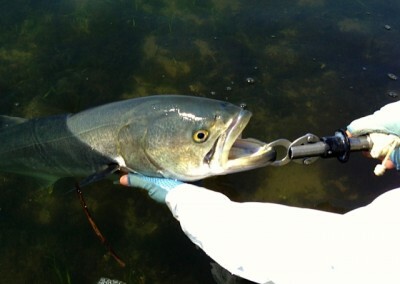 Novice anglers may gain a lot of confidence catching countless numbers of these “choppers” in a day’s outing. 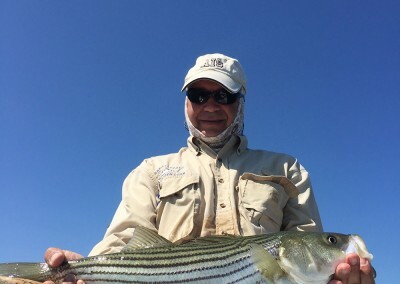 Last year when I joined you for a day of striper fishing I had the time of my life and I did not think the trip could easily be topped. 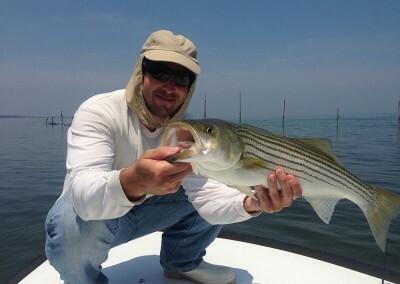 Well Merritt, I want to thank you for the single best fishing experience of my life in Key West this year. 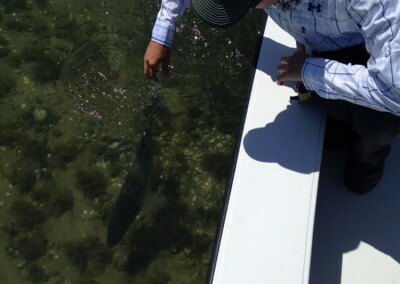 When you called to invite me down to chase tarpon the easy answer was ,”yes!” Little did I know how great the fishing would be. 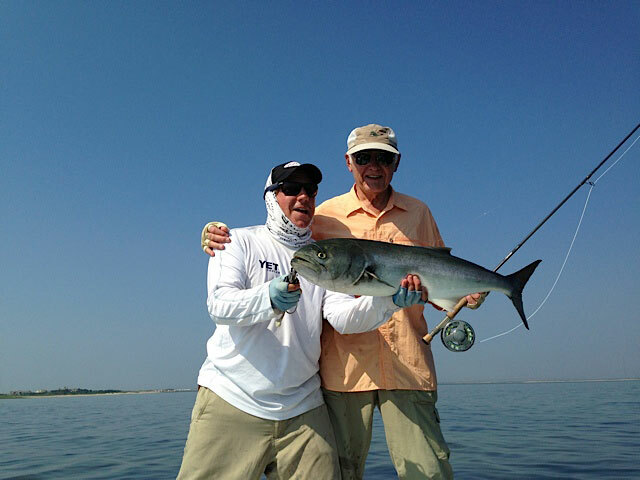 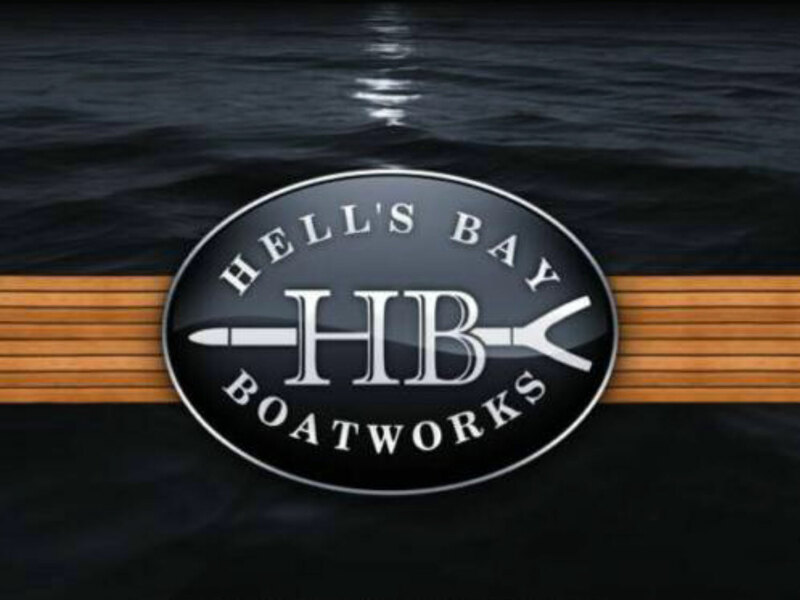 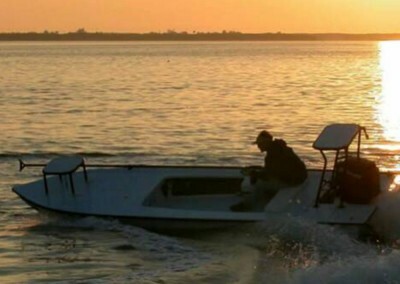 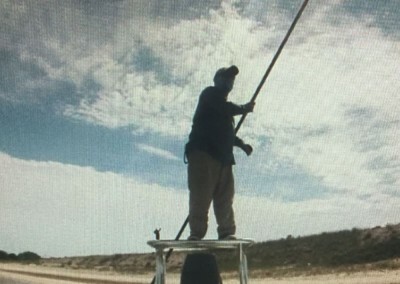 Your knowledge of tarpon fishing and good humor made this one of the great fishing trips ever. 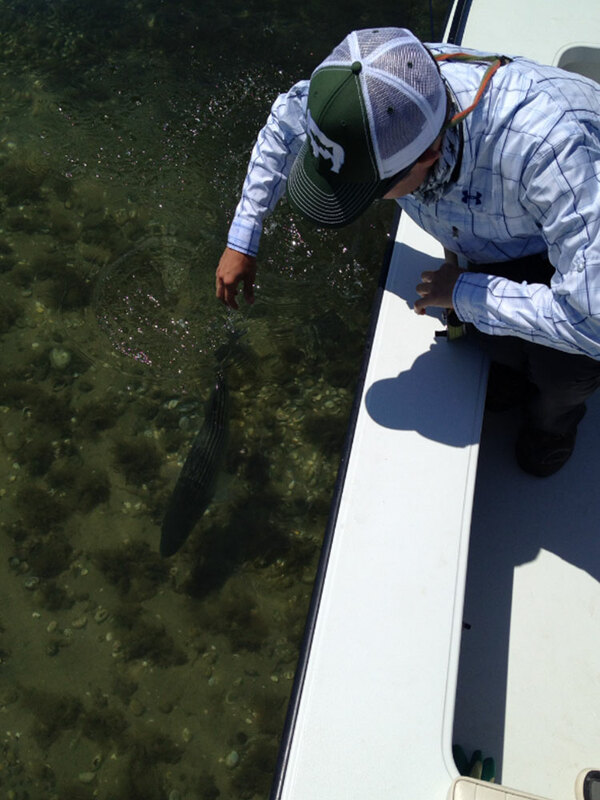 Also, thank you for taking my son and daughter on your boat for a few hours of tarpon fishing. 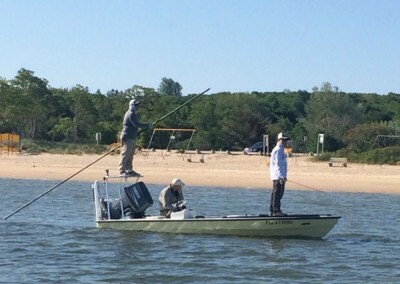 They are still talking about it.